“No to Cybercrime Law” protests became viral in popular social media sites, such as Facebook and Twitter, as soon as news of the passing of the Cybercrime Prevention Act of 2012 (RA 10175) hit the cyber sphere in September. Due to a provision that a person can be imprisoned for 12 years because of libel, Filipinos have been actively expressing their objections to the new law. However, what constitute as libel and the limitations of freedom of speech remain unclear. To provide an avenue for discussion, the Lopez Memorial Museumwill be holding a lecture Liberty and Libel: A Closer Look at the Cybercrime Prevention Act of 2012 on October 20, 2012, 2-4 PM with Atty. Florin Hilbay and journalist Norman Sison. Atty. Florin Hilbay, an Associate Professor at the University of the Philippines College of Law and Director of the Instituteof Governmentand Law Reform, will explore the topic from a legal standpoint and discuss how the newly-enacted Cybercrime Law affects ordinary Filipinos. Writer and journalist, Norman Sison, will talk about how our revolutionary heroes used writing as a weapon to advocate social change as evidenced by the publication of reformist magazine La Solidaridad, the novels Noli Me Tangere and El Filibusterismo, and the newspaper La Independencia. He will also discuss how freedom of speech has been a recurring issue in our country’s history since the Philippine revolution began over a hundred years ago. 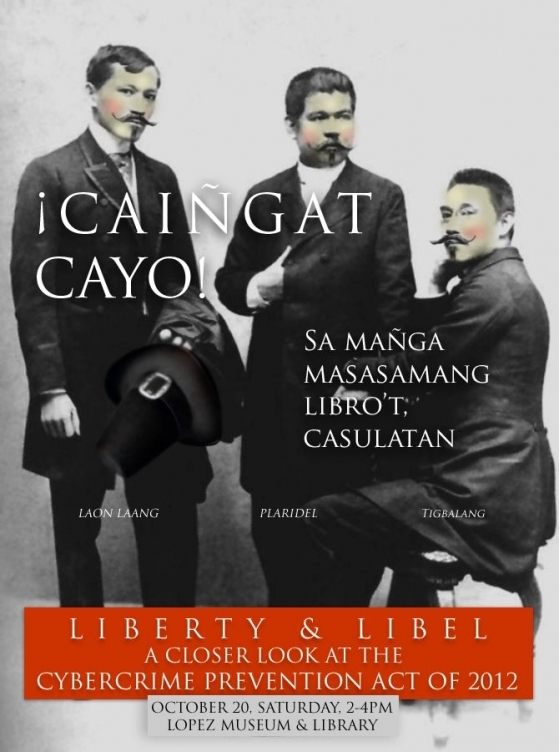 To complement this lecture, the library of the LopezMuseumwill be displaying copies of original La Solidaridad, La Independencia, and El Renacimiento, as well as early editions of Noli Me Tangere and El Filibusterismo from its rare book collections. A lecture fee of Php120 covers admission to the museum, which currently features the exhibitions Beat and Liberal Streaks. For inquiries and registration, please call Fanny San Pedro/Ethel Villafranca at 6359545 or 6312417 or send an email to edvillafranca@lopez-museum.org.ph. The Lopez Memorial Museum is at the ground floor, Benpres Building, Exchange Road corner Meralco Avenue, Pasig City. Museum days and hours are Mondays to Saturdays, except holidays, 8am-5pm. ‹ MyRizal: Magpaka Robredo Tayo!